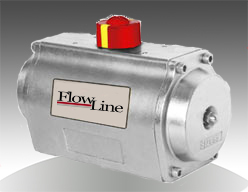 Flow Line Series 22 double acting and Series 23 spring return actuators are technically advanced stainless steel rack and pinion actuators. The Series 22/23 incorporates seven sizes ranging from 147 to 9462 in pounds. Features such as fine tooth rack and pinion. Internal travel stops and stainless steel hardware ensure the standard of performance expected from Flow Line Controls valve automation products. 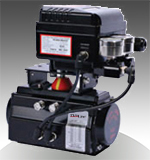 Series 21 spring return actuators are available through out the size range. 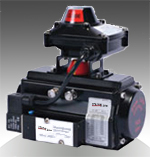 Series 52 and 53 limit switches provide local and remote valve position. Series 55 and 56 positioners are available with either a 3-15 psi or a 4-20 MADC signal. 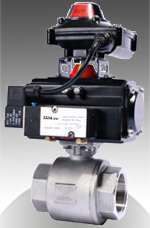 Series 20 and 21 actuators mount directly to ball valves conforming to ISO 5211. Bracket and couplers are available for other patterns. Series 20 and 21 actuators mount directly to butterfly valves conforming to ISO 5211. Other mounting patterns are available.